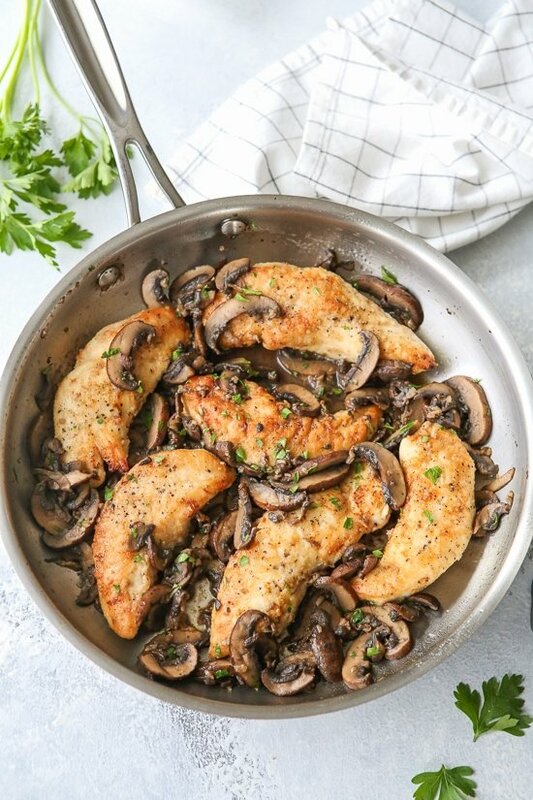 Chicken and Mushrooms in a Garlic White Wine Sauce is a great-tasting, 20-minute dish, perfect for busy weeknights! We like it served with brown rice, pasta, quinoa or farro on the side, or a serve it with roasted veggies and a salad. This recipe was originally lightened up from my friend Julia’s recipe back in 2011. She has twice as many family members in her household so I halved her recipe and cut back on the butter and olive oil. I then substituted half of the wine for fat free chicken broth and the results were fantastic. If you prefer to use chicken breasts, slice them into strips before you cook them. 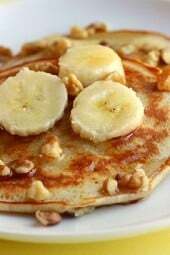 To make this gluten free, you can use rice flour, or leave it out for Paleo or Whole30. Those of you who don’t cook with wine, use chicken broth instead. Season chicken with salt and pepper. Lightly dredge in flour. Add chicken to the skillet and cook on medium heat for about 5 minutes on each side, or until chicken is no longer pink. Add wine, chicken broth, parsley; stir the pan with a wooden spoon breaking up any brown bits from the bottom of the pan. Cook a few more minutes or until the liquid reduces by half. 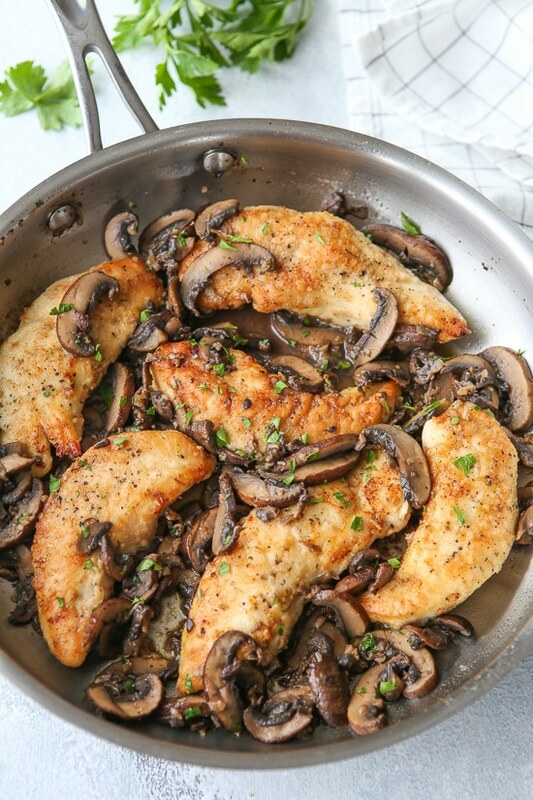 Top the chicken with the mushroom sauce and serve. 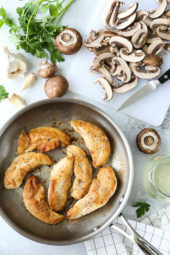 I lvoe food, this chicken and mushrooms recipe is really good, i try it at home. Wonderful dish. I served it with a bag of Steam Fresh green-bean and mushroom risotto. Instead of chicken stock I used Better than Bouillon. Having left overs for lunch today and probably another day or two, since I’m cooking for one. Easy to make. Delicious! Will make again and again. I made this with your roasted cauliflower rice. Both were delicious! I added a bit of Parmesan to the top. Amazing—we will be making this again! And to those who are having trouble getting the flour to stick—don’t pat dry your chicken. You just want a light dusting of flour to give it some color. 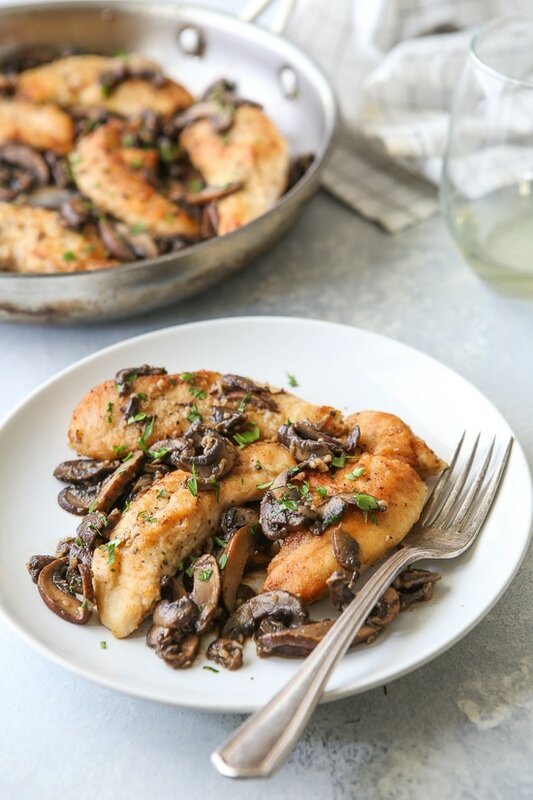 These chicken and mushrooms in garlic white are so Instagrammable and adorable! As you know I made it a short while ago and it was lovely! Thx for sharing! I have never felt very confident trying recipes that call for wine ~ because I don’t what specific brand/type of wine to use?? Any white wine ! I use what I drink. 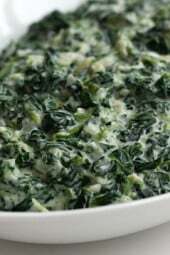 Can I substitute the mushrooms for sauteed spinach? I want to like mushrooms so badly, but I can’t get into them! Why does this recipe have oven pre-heating instructions? Maybe a mistake? Just want to make sure I’m not missing something! It was tasty, and a good basic recipe. I added a little garlic, and some sour cream. Yummy! Amazing chicken and mushrooms! Combination of taste, I like a balanced diet, a variety of vitamins in it. I really like. I love wine country and since I live in Washington I’ve visited winey country here and in Oregon, plenty of times. The last time I was in Napa I was very young and would love to return as I really loved the landscape. Domaine Carneros is quite grand and I’d love to see the winery -Grgich Hills Estate- that put California wines on the map. I also like train rides and that would be such a fun way to taste wines and see the scenery pass by slowly. Does the parsley add much to this dish other than color? I have everything on hand except for that, I wonder if I could omit it or substitute anything else. I think I have parsley flakes in the spice cabinet, hmmm. What could I use instead of butter? Made it tonite! I added 2Tbs capers and a bit of lemon juice. Really great recipe, my husband loves it! Made this tonight and it turned out pretty good. I HATE cooking chicken in a skillet – maybe next time I’ll bake it. I used 3 garlic cloves in my press and coarsly chopped 2 additional cloves that I added in at the same time as the wine & broth. I made this tonite, only I doubled the amount of broth, wine and garlic, put in a couple sprigs of fresh thyme with the wine and broth mixture, and put shaved parmesan on the chicken. I served it with wild rice and fresh green beans. It was AMAZING! Made it for my husband he loved it! Not complicated fast and easy! 2nd time making it. We made this last night (sans wine and used coconut flour) and it was delicious! The chicken with mushrooms, garlic and white wine sauce was absolutely delicious! I’ll be making this one for company because it was that special! Not only that, but the presentation is very pretty as well! So yummy! I’ve made it a few times and every time everyone loves it. Thanks for sharing this awesome easy recipe! Fantastic, great flavor! I would totally recommend. A bit disappointed in this one. I agree with the others.. it needed something more. I followed the recipe to the letter. I found the flour was coming off on my chicken, may use rice flour next time, but it needed some lemon or something fresh to liven it up. I thought it was OK, but won’t be repeated at my house. Sorry, gina!! It needed something more. I thought maybe a twist of lemon juice and some capers.. it just seemed a bit off. Had a tough time keeping the flour on the chicken.. next time, I might just not worry about flour at all. Easy to make, little prep work, and tastes FANTASTIC!! Great recipe, I like to add diced onion before the garlic and a couple extra cloves of garlic! Delicious! Thanks for the great recipe! Made this last night after a very long day… it was easy and it actually surprised me how tasty it was! Definitely adding it into the rotation! I had this for supper tonight, so good! I made a few modifications for the ingredients that I had on hand (no chicken stock, so I used more wine & I had one 8 oz chicken breast that I sliced into 4 tender shaped pieces). It will definitely be going into my rotation. I love this recipe! You have the best recipes because they are easy to make and they taste good. Delicious! I didn’t have tenderloins, so I just cut whole breasts into strips. Husband loved it, so I’ll definitely be making it again. Delicious quick & easy! Made the recipe pretty much as written – used Wondra flour because it is finer. Made this for dinner tonight and it was delicious! I didn’t have any white wine on hand so I added extra chicken broth (as you suggested) and a tsp. of apple cider vinegar. Also, this was super easy and quick for a weeknight dinner. Paired it with grilled zucchini. ???????? You have to use WW recipe builder, the only way to get accurate points! The calculator will make chicken 2 points, but the new plan is 0. Gina- how do you count wine in your recipes since most of calories and alcohol burn off during cooking? Do you put the full amount in the WW recipe builder? I’ve always wondered this! I just created this recipe in the recipe builder in my Weight Watchers app and it came out to 1 point per serving! Cant wait to make it. Easy and delicious! I added more pepper and white wine. It was perfect, I will surely make it again. Another fantastic recipe from Skinnytaste, yay!! This is the second time I’ve made it, so good. I tried this earlier this week and at first found it to be very bland (I do tend to cook with very little salt and add salt to the finished product as needed). BUT tonight I tried it again with a sprinkle of salt and fresh Parmesan and it was fantastic. If you find your end result tasting flavorless, try adding a bit of salt and/or Parmesan. Sometimes I find that it’s not always obvious when more salt is needed. Would make again! Kaitlin, I like your suggestion of adding Parmesan cheese. Did you add the cheese to the sauce as it was cookIng, or sprinkle it on after it was cooked and ready to serve. I added edameme shells to add a bit more green and a little crunch to the mix. Overall the recipe was spot on!